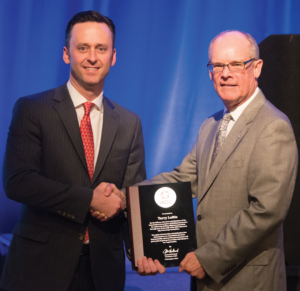 Exemplary Service Awards (ESAs) recognize individuals for their outstanding contributions to IADC and their commitment to improving and advancing safety, training and technology throughout the industry. It is through the direct efforts of Members that IADC is able to deliver the products and training programs requested. ESAs represent the deep commitment by IADC’s membership to work together to make our industry better. 2017 Exemplary Service Award Winners (left to right): Jorge Lebrija, Dan Scott, and Andy Poosuthasee. Mr. Scott, who is now retired, holds 140 US patents and is recognized as one of the most prolific inventors in the history of Baker Hughes. Mr. Scott served 26 consecutive years on the IADC/SPE Drilling Conference Program Committee and currently serves on the IADC Drilling Engineers Committee Board. Mr. Lebrija is Director of Supply Chain, Global Sourcing for Ensco, and is currently co-chair of the IADC Supply Chain Committee. Mr. Poosuthasee is the Director of Supply Chain for Vantage Drilling and is currently co-chair of the IADC Supply Chain Committee. 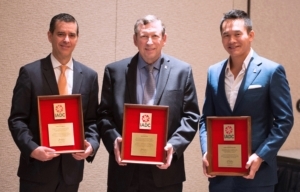 Mr. McReaken was recognized for serving as IADC Secretary/Treasurer since 2013 and for his service as an IADC Executive Committee member. 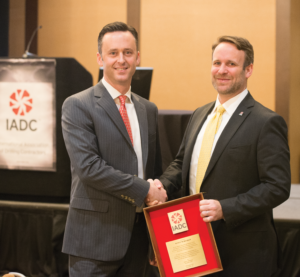 Mr. Loftis was recognized for his work as chairman of the IADC Advanced Rig Technology (ART) Committee.